Where can I see a copy of the event’s rules and regulations? Please click to link: https://wagovcup.wordpress.com/resources/ and go to Click Download Application for PDF Copy. Or you can contact us at wagovcup@gmail.com. Refusal to adhere to tournament committee direction and decision may result in disqualification and removal from event without refund. When will registration packets be mailed out? We plan to mail out information packets to dojangs and have online registration open in August. To be put on a contact list or have promotion material mailed to you please email us at WAGOVCUP@GMAIL.COM. We will not have any participant registration at the door (this includes coach and competitor passes). What are the competition divisions? What division are considered World Class? All Black Belt Sparring for 10-11, 12-14, 15-17, 18-32 will be considered World Class and use Daedo Gen 1 Electronic Chest Guard System and Electronic Head Gear. Athletes will need to provide their own Electronic Foot Protector and Heel Sensor (Gen 1 or Gen 2 allowed). Black Belt sparring in these divisions will only be available in World Class Division for this year’s event. 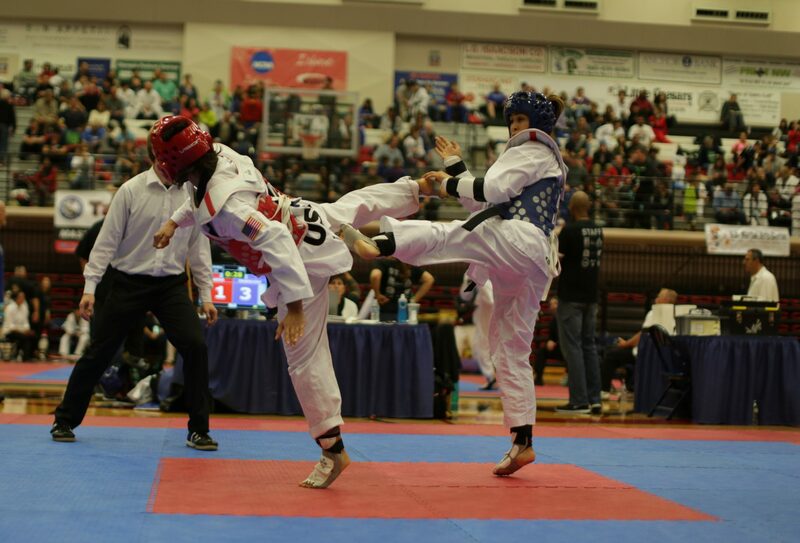 Black Belt Poomsae division will use modified USAT/ WT Competition Style Format. Black Belt poomsae competitors will be designated poomsae in bracket and round format. What guidelines will be used for judging? What is the required uniform to participate? Any Taekwondo V-Neck Uniform in any color is acceptable for color belt divisions only. For black belt 10-11, 12-14, 15-17 and 18-35 sparring competitors proper taekwondo white uniform with black v-neck is required. For black belt 10-11, 12-14, 15-17, 18-35 world class poomsae competitors appropriate WTF/ WTF assigned poomsae uniform is required. No offensive material allowed. Tournament Committee reserves right to ask competitor to change. Must have proper working and undamaged gear. Refusal to adhere to tournament committee decision may result in disqualification and removal from event without refund. What is coach / master / VIP dress code? No offensive material allowed. No hats, No shorts, No flip flops, No ripped/torn jeans or article of clothing, no sleeveless shirts. Tournament Committee reserves right to ask competitor to change . Refusal to adhere to tournament committee decision may result in disqualification and removal from event without refund. Shoes are NOT allowed for any events. However, if shoes are medically required, please bring a written doctor’s note that states shoes are required for participation. This note will need to be submitted to the Holding Area Manager prior to your event. Board holders will be allowed to wear mat/ taekwondo approved shoes only. What are the age divisions and participant gender specifications? Events will be separated into MALE and FEMALE with the exception of Team Forms Divisions. What are the age divisions for breaking divisions? What types of breaking divisions will you have? Creative breaking division using demo boards. How many participants will be in each division? The Organizing Committee will determine divisions based on rank, age, weight class (sparring) that athlete registers. Exhibition matches maybe requested (see tournament director for details and request forms). To be as fair as possible for all participants with the discretion to create divisions outside these guidelines, if necessary. Gold, Silver and Bronze medals will be awarded to 1st, 2nd and two 3rd place (exception with single 3rd place team in team forms divisions, demonstration team and single 3rd place in breaking divisions). Is there a maximum number of events for each participant? Four is maximum number of events a person can participate in. However, a person cannot register for the same event more than once. (For example, a participant CANNOT be in 2 Team Forms or 2 Breaking Divisions) The more events a person participates in, the more likely the chance of scheduling conflicts. The Organizing Committee will work hard to ensure participants will not be scheduled to perform in 2 separate events at the same time. How is my belt ranked? What are the weight classes for 10-11, 12-14, 15-17 and 18-35 year old black belt sparring divisions? Weight classes will be same as USAT Designated weight category. Who will use electronic chest guard (E-Hogu) and need to provide their own Electronic socks? 10-11 Youth, 12-14 Cadet, 15-17 Junior and 18-32 Senior Black Belt Sparring Divisions. Competitors must provide their own compatible E-Foot Protectors and Heel Sesnors. Event will provide the E-Hogu and E-Headgear only. Small limited supply of e-foot guard and sizes will be available onsite for purchase. What type of forms can I perform? We will allow competitors to perform Taeguk and WTF Black Belt poomsae for individual forms competition. The 10-11, 12-14, 15-17 and 18-32 Black Belt division will be assigned designated poomsae for bracket rounds. Designated poomsae list will be posted the week of the event online. My Team Traditional Forms Team has participants with different ranks. What Form do we need to perform? Your team should perform the form for the LOWEST belt rank. For example, the team has 3 members: two are 1st Dan Black Belts, and the third member is a red belt. The entire team should perform Taegeuk Pal Jang (8), NOT Koryo. Teams will be divided up into pairs division, teams and family poomsae divison. Family Team Poomsae: Minimum two members and up to five members performing lowest belt rank. Can I use props or play music during creative team forms or creative breaking division? No. Props must be approved by tournament committee before use. Music/ Sound system will not be provided. Teams must provide their own music (which may not be offensive or political) and own demo boards. Performance will be 5 to 7 minutes in length. Teams must be in matching taekwondo uniforms, teams of 5 minimum and maximum 10 members. Boards and props may be examined for safety and fairness by tournament officials. Teams are not allowed to use the following: confetti, flammable items, sharpened weapons or food / liquid items. Tampering or altering boards or going over time limit may result in disqualification. All teams will compete in one demonstration team division. See rules for full competition rules. Is there a Hotel with special deals? When will schools received 2 free coaching pass for 10 or more early registered competitors? We will be emailing all qualified clubs/ dojangs owners a special promo code to register as coach after September 21st Early Registration Deadline and confirmation requirements have been met. Where can I obtain spectator tickets? Competitors and coaches do NOT have to pay spectator fees with valid credentials. However, all NON-participants must purchase a ticket for admission to enter St. Martin University Pavilion. If you need special assistance due to medical reason please contact tournament committee. Ticket Prices: Children 4 and under are FREE only if they will be sitting on someone’s lap. If they require a seat, you will need to pay for an additional ticket. There is NO price difference for Adult and Child tickets. Tickets can only be purchased at the door. $10 each and Cash Only. There is an ATM Located on site in front of the entrance. Is there a fee to park at St. Martin University? What do I need to bring to Participant Check-In? Upon completion of your online registration, you will receive an email confirmation with all your events. You MUST bring the email confirmation and completed participation waiver with you to pick up your participant badge. I am interested in volunteering, becoming a vendor, sponsorship or am a certified referee/judge in taekwondo how can I get involved? Please contact us with your request to wagovcup@gmail.com or call (360) 459-3661. It is highly DISCOURAGED to have someone pick up your badge. Upon pick up, you will be requested to sign a document verifying all events are correct and CANNOT be changed. (Changes will ONLY be made if there was an error by the Organizing Committee.) Anyone who signs on your behalf will be acknowledging all event registrations are correct and CANNOT be changed. If a Coach picks up badges for participants, the coach MUST bring the email confirmation page and sign the document that all event registrations are correct. Upon completion of your online registration, you will receive an email confirmation with all your events. You MUST bring the email with you to pick up your participant badge. You will not be allowed to enter without your participant badge and will have to make arrangement with your coach or whoever picks up your credentials or will be forced to purchase spectator ticket. Badges can be re-printed at the Participant Check-In area for a $5 re-print fee. Can I take pictures during the competition and at the award podium? Cameras and camcorders are STRICTLY PROHIBITED from the competition floor, holding area and private areas without proper media floor pass. Any cameras, camera phones or camcorders in this area are subject to removal from venue without refund. Pictures CAN be taken from any spectator area and designated approved areas. Pictures on the award podium are allowed in approved area (see staff for details). Any flash photography will interfere with the official event photographer, disturb the official records and slow down the process will not be allowed. Please contact tournament committee for details. See rules and regulations. NO food or drink is allowed in the St. Martin University Pavilion. Sport water bottles ARE acceptable for water but MUST be EMPTY upon admission if requested. Concession stand is available onsite by St. Martin’s University Athletic Department. No coolers allowed. If you need to bring in small personal cooler for medical reason please contact tournament committee for approval at wagovcup@gmail.com with your request. Is smoking or e-cigarette or vaping allowed at event? NO smoking of any type or e-cigarette or vaping is allowed anywhere during the event or venue or parking lots. A tentative schedule of events will be available on this website. The final schedule will be released after the registration deadline. Listen for announcements on the main competition floor for current competitor staging times. See schedule of events section. What is there to do in Olympia, WA? Olympia area is a great family friendly destination. The Capital Campus, Famers Market, and the Hands On Children Museum are just some of the great attractions the city has to offer. For more information, please visit www.visitolympia.com.